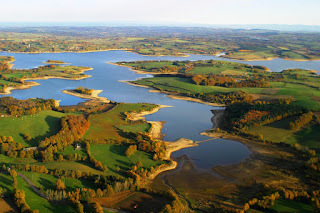 The public water Etang d'Ardres is a stone's throw from the Belgian border in northern France. With a total size of 64 hectares this beautiful water is known for its big carp with some fish of more than 30 kilos. The number of larger public waters in northern France near the Belgian border is limited. The Etang or Lac d'Ardres in Northern France with 64 hectares is one of the largest public waters near Belgium and therefore very accessible by car for carp anglers from Netherlands. As the name suggests Lake Ardres is located near the eponymous village. Lac d'Ardres is used for various activities, besides carp include several water sports. The wooded area makes it a beautiful carp spot, with many big carp captured every year. Night fishing is allowed on Lac d'Ardres. Please note that it is a so-called private domain, where different rules apply. E.g. a separate local license (timbre in French) must be bought in addition to the regular French carp license. The lake is know for its nice average catch weight and specimen carp of more than 30 kilos. The absolute record fish is not known to us. However, there are several reports this year of carp weighing up to 28 kg. A session on Etang d'Ardres can also be combined with a holiday. At the lake consists out of two different sites (see map above). These sites also are situated exactly in the zone in which can be fished. In addition there are two restaurants located between campsites and a supermarket. In short; everything you need is within reach. Check out a nice Youtube video about carp fishing on Lac d'Ardres.